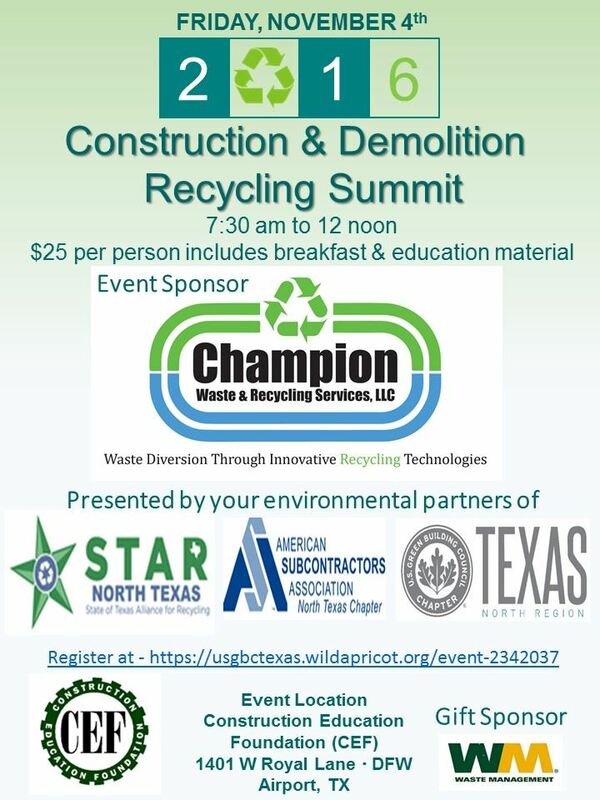 The Commercial Construction Recycling Summit was first held in 2013. The idea of Rachael Green, then a member of both the USGBC North Texas Chapter and STAR (State of Texas Alliance for Recycling), to help the commercial construction industry learn about waste diversion from the job site. This event is for construction firms, recyclers, haulers, salvage/reclaimed material dealers, municipalities, sustainability professionals, and any others who are interested in improving rates of waste diversion in C&D, the procedures and ease of the diversion process, and the benefits of reuse and recycling.